From the outset, our aim at South London and Maudsley NHS Foundation Trust was to provide genuine, real life experiences of our mental health services to staff from the Department of Health (DH). So far, we have had the pleasure of hosting three cohorts and I can confidently say it has been a demystifying experience for all involved. We intentionally provided no concrete plans for each of the days spent in clinical services which allowed our clinical staff to expose staff from DH to the everyday challenges and experiences of their work as it happened in real time. This did create an extra burden on employees taking DH participants around, however, it was a task they willingly and enthusiastically accepted. Across the four day placements, DH staff were embedded within a range of services within the Psychological Medicine Clinical Academic Group (CAG). Firstly, the group spent a day and a half observing our mental health liaison team working both within the Emergency Department (ED) and the inpatient wards within King’s College Hospital. This enabled them to see patients who presented in crisis at the ED at Kings being rapidly assessed and treatment plans being initiated accordingly. Extreme cases are unsurprisingly a regular occurrence in crisis services; as such it proved a real eye-opener on the first day, as well as an educational experience in terms of the professionalism and dedication of our clinical staff. This was followed by a day in the Lambeth triage ward – familiar to some thanks to the successful Channel 4 documentary series Bedlam. 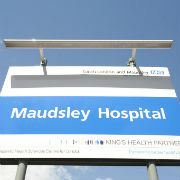 The ward is the single point of admission for the borough of Lambeth, a borough with three times the national average rate of psychosis in its population. DH staff were able to observe how the multi-disciplinary team assesses, plans and implements treatment for those in the most acute phase of their illness. On the final two days we offered two very different experiences. One day was spent with our home treatment teams who provide intensive support to those in crisis as an alternative to a hospital admission and also support at the point of transition back home to enable as early a discharge from hospital as possible. Staff from DH were able to go on home visits, as well as see how the team reviewed the progress of each patient and amended treatment plans accordingly. On the final day, we provided our guests with an insight into two very specialist areas of the Psychological Medicine CAG’s services – the Mother and Baby Unit and the Eating Disorders Unit at the Bethlem Royal Hospital. These visits were short, as it had been a packed week, but they were able to gain an insight into the unique and very different needs of patients within these services and learn from our staff how they provided care in these challenging scenarios. All in all, we are extremely happy to have taken part in the Connecting to Patients programme and look forward to hosting future cohorts from DH. As well as giving DH staff real life exposure to what our staff do day-in day-out on the front line, I believe the programme goes a long way to bridging any gaps, perceived or otherwise, that exist between Trusts and the Department. The feedback we received from DH staff on the final day showed that the programme had been of huge benefit, helping them understand services in more detail. They felt this would enable them to be able to contribute more effectively when their individual work back at the Department had an impact on mental health service provision. We are very proud of the work we do to improve the lives of those affected by mental health issues, and the Connecting to Patients programme has enabled DH staff to gain first-hand personal experience of at least some of the services we provide. In addition, several staff have exchanged contact details and we were delighted to be offered the opportunity to shadow some of the staff within the Department. Our hope is that the programme serves to continue raising mental health on the public agenda as a genuine and important issue affecting all in the UK.